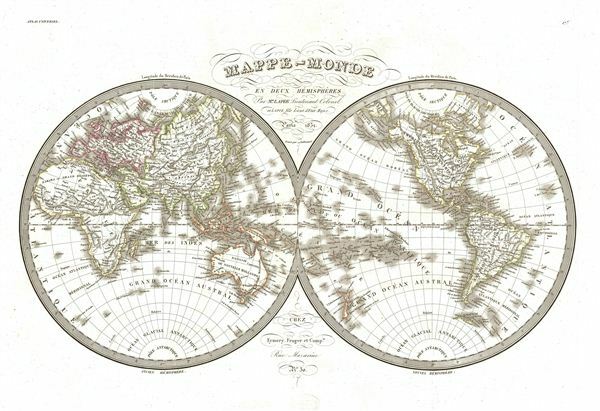 A fine first edition example of M. Lapie's 1831 map of the world in two hemispheres. Lapie's map offers fine detail throughout with elevation rendered by hachure and political boundaries demarcated with outline hand color. A stunning map, this example offers typical French decorative elements including elaborate typesetting in the central title area. Cartographically it represents the most up to date discoveries of the time though limited geographical knowledge, particularly in Africa, Australia, and Central Asia, is in evidence. In Africa there is no trace of the great Rift Valley lakes and the source of the White Nile is set in the speculative Mountains of the Moon. The interior of Australia is blank though the coastal colonies around Botany Bay, including Sydney are noted. The disputed sea between Japan and Korea is here identified as the 'Sea of Japan.' This map was engraved by Armand Joseph Lallemand as plate no. 17 in the first edition of M. Lapie's important Atlas Universel. This map, like all maps from the Atlas Universel features an embossed stamp from the Lapie firm.